He had the sand for it, to use an old expression referring to courage—he just didn’t have enough actual sand, as it turned out. North Carolina pilot Jonathan Trappe had spent a year’s pay on the helium needed to fill 370 brightly colored balloons (typically used for advertising car dealerships and the like) that he hoped would carry him from Caribou, Maine, east across the Atlantic to Morocco, or, England, or Sweden, or Spain, perhaps. Trappe had a team behind him, including a meteorologist who was able to pinpoint a somewhat more precise destination by the time the September skies cleared over Caribou and many hands set to work building Trappe’s remarkable flying machine. “It gets narrowed down to one of this handful of countries,” Trappe recalled in a Jan. 7 telephone call from Manila, where he is on assignment for his day job as an IT project manager for Accenture. By night, he is now reading up on balloons used for scientific research that might hold the key to his “white whale,” crossing the Atlantic Ocean by cluster balloon. Contemplating a fresh attempt at some future date, he conceded that there are much easier ways to get to Barcelona, listing several Boeing aircraft that handle the job daily with ease, and the luxury of being able to land at a place of their choosing. The aircraft, it turned out, needs some modification to handle a voyage of this scale. Trappe, aiming to be the first to cross the Atlantic by cluster balloon, said he is one of two certificated pilots in the world who fly such systems, and the other guy hasn’t flown for a few years. Trappe has already flown across the English Channel and over Oshkosh (EAA AirVenture 2010); in 2011, he flew the cluster balloon using 16-by-16-foot purposely constructed house for a gondola. His exploits are widely chronicled in mainstream media and his own blog. He stakes a credible claim to being the only pilot ever to land a house, and has had many interesting conversations with federal aviation regulators in various countries in recent years. Trappe said he makes sure to contact the local flight standards district office, along with any foreign agencies that might have jurisdiction, well in advance of every flight. He has gone to great lengths convincing the FAA that his balloon—built afresh for each journey—is, in fact, an aircraft he can control. 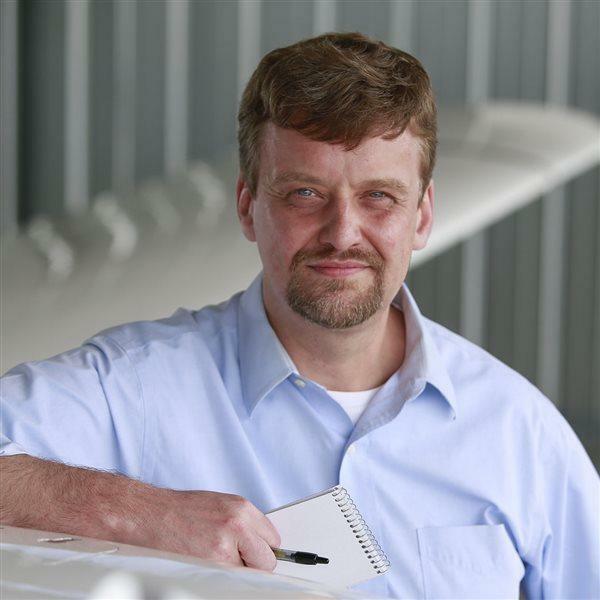 It took about a year (and nine rounds of paperwork) before the FAA issued an experimental/exhibition airworthiness certificate for N878UP, Trappe said, and it might never have happened without an understanding staff at the FSDO level who helped Trappe convince the final decision-makers. He demonstrated he could climb (the easy part when one has 3,050 cubic meters of helium attached), arrest a climb (somewhat more difficult), descend, arrest a descent, and fly level. Gas balloons can do all of those things, with careful balancing of ballast and venting of gas. To slow or arrest descent, Trappe emptied bags of sand. He could cut away individual balloons to halt a climb, or land. On the morning of Sept. 12, rising over 318 miles of open water and being blown toward Newfoundland, he had to do quite a lot of that. There was Col. Joseph Kittinger, the retired U.S. Air Force pilot and record-setting balloonist, with a hand on Trappe’s contraption, holding it steady as Trappe said his goodbyes. Kittinger, who had helped Austrian daredevil Felix Baumgartner break Kittinger's altitude and freefall records the year before was now helping another pilot take aim at one of his records: In 1984, Kittinger was the first to fly a helium balloon across the Atlantic, though Trappe aimed for the distinction of doing it first with a cluster balloon. As “The Star-Spangled Banner” played from a loudspeaker, Kittinger held a shroud with one hand and saluted, his other hand over his heart. Kittinger then clasped Trappe’s outstretched hand for a long moment, and told him “your dream is coming true.” The anthem ended, Trappe rose into cloudy skies, cheered by hundreds. The plan began to unravel soon after. Trappe said he had waited for the best overall weather he could hope for, but the local climate was not working in his favor. Rising through multiple cloud layers, his balloons heating and cooling in turn, required a lot of trimming, which involved expending his limited ballast much more quickly than he had hoped. Trappe recalculated his range, taking the rapid depletion of ballast into account, and found he could expect to travel another 1,500 miles. Trappe has been reading academic papers on super pressure ballooning, and saving up for another 3,050 cubic meters of helium, or thereabouts. Jonathan Trappe has a pilot’s certificate to operate gas balloons, and spends years preparing for individual flights with a large team supporting the effort. That, among other things, sets him apart from “Lawn Chair Larry” Walters, who famously encroached on the busy airspace of Southern California in 1982 flying a lawn chair suspended from a homemade cluster balloon. “These guys make my life difficult,” Trappe said, noting that ill-conceived adventures of noncertified would-be pilots make it harder to convince government regulators to approve Trappe's own exploits. Trappe also carried a communication radio, GPS beacon, and used a double-hulled life raft as the base of his gondola. Landing in a remote Newfoundland bog, he spent the night in purpose-built shelter before being retrieved by a news helicopter that landed nearby.